The resident two year old has inspired me to share some his recent favorites. This again, is by no means a sorted list of top five/six reads, but just a small subset of the random collection of books we've come across over the last couple of months that has appealed to us. 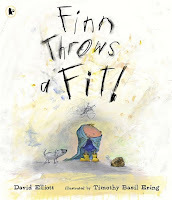 Little boy Finn, comically rendered as an egg-like blob with limbs, is having one of those bad days. The book doesn't dwell on why he has a bad day as that is immaterial. It also doesn't say how the fit subsides, as that is rather immaterial. 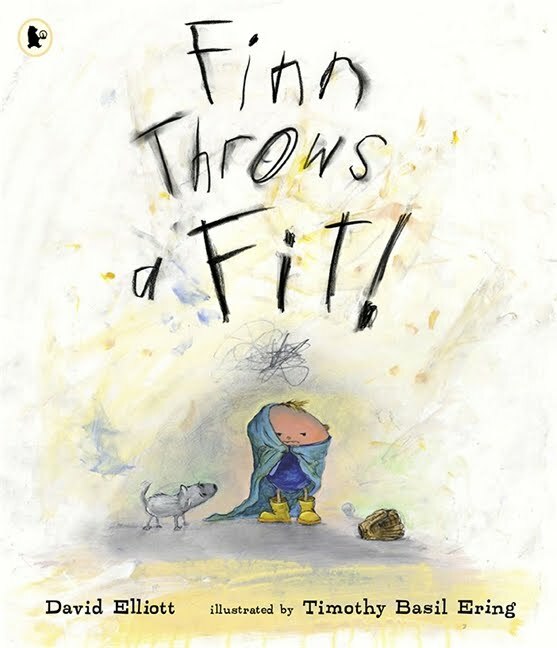 But, it focuses on how the environment looks when Finn is throwing this fit. He cries... the house floods. Lightning, Earthquake, Blizzard all seem to plague this house, thanks to Finn. Initially, I was a bit skeptical, wondering why on earth would a parent read this to their child, focusing on the fit, as if encouraging it and even reveling in it. It didn't help that the parents in the book seem to be portrayed as poor saps. But, I guess from my side of the fence, I can see the positives of this book, as Ana easily recognized the silliness of it, and Oggie didn't care about the fit all. The text is very simple, even if some words are out of the typical toddler's range, but, gives us a chance to explain it, talk about it, if we so feel. The pictures help a lot in this process. In the last page where Finn is impossibly adorable, his almost Mr.Hyde to Dr.Jekyll transformation leaves us smiling. As a bystander, this book made the whole toddler tantrum thing seem amusing. Which is an attitude some of us parents find it hard to develop when in the middle of it. I loved this book as soon as I laid eyes on the cover - the happy dancing elephant simply teased my craft-y side: my mind immediately assembled corrugated paper, paints, scissors and glue to affirm that Imitation Is The Best Form Of Flattery Adoration. 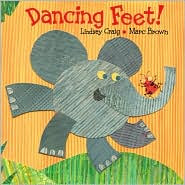 Stompity, Clickity, Creepity, Stampity - the repetition along with pictures of happy creatures dancing makes this cheery little book a lot of fun to read aloud. Polo is a spunky pup who likes to set off on an adventure armed with just his backpack, resourcefulness, sunny disposition, and curiosity. The vibrant colors, playful cartoon-like drawing, and dynamic easy-flowing panels make this wordless book a treat to "read". Wordless books are wonderful for all ages - we can choose to interpret it as our minds allow. I just let Oggie point to the picture and "talk" about what he sees. Sometimes it is "Uh-oh, he fall in the water", sometimes it is "He in the boat"... and even if it seems like Oggie is just describing the panels, he seems to have fun turning the pages to read to "the end". And then, looks at me expectantly to read it again, this time using my words and interpretation to keep up the flow. 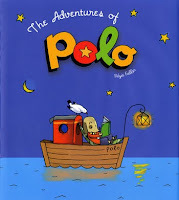 Originally published in France, Polo seems to have cultivated a universal following. The stories start out simple and sometimes can get quite complex, depending on who is "reading" it. It reminded me a bit of Harold and the Purple Crayon in that Polo finds a rope, which becomes stairs that he uses to climb up and then slides down the rope slide to land on a cloud... It gets from absurd to fantastic in no time. 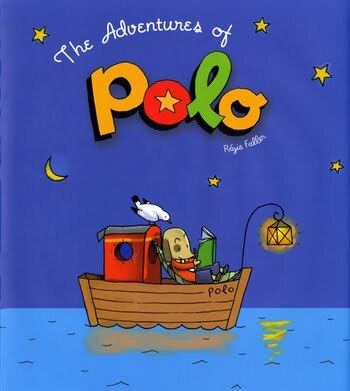 Through close-ups in some panels, sometimes stopping the flow with a full-page panel, along with subtle hints like punctuation marks, not to mention facial expressions, artist Faller makes it a delightful experience to follow Polo along in his adventures, silently. What's the only thing a little hungry mouse can do with a red ripe strawberry when a big hungry bear is expected any minute? Why, eat it! After sharing, of course. And that is what he does in this sweet book with huge eye-catching illustrations inviting requiring the reader to participate and propel the narration forward. The brilliance of it, to me, is that, left to his own devices, the mouse would have happily picked the strawberry and enjoyed it at leisure. But, us readers are obligated to play this sort of devil's advocate, egging the little Mouse on, leaving the threat of a (non-existent) Bear hanging, with the ulterior motive of getting a bite of that sweet juicy strawberry for ourselves. The text is simple even if it has a few words that are possibly not part of a typical toddler vocabulary, but the pictures easily explain the meaning without me having to. The page showing the mouse and the strawberry in disguise never fails to elicit giggles every time we read it. The mouse is incredibly adorable, and the strawberry seems like a mutant giant next to the tiny mouse who scrambles to keep it from Bear's hungry paws. The book also talks about sharing. Of course, Bear is never in the pictures, even if he is in the picture. Just the anxiety of losing this ripe juicy meal to a large and strong Bear seems to drive the mouse as he tries to save the strawberry for himself. And, the relief and elation he feels in the end after having eaten it (and sharing half with the reader) is simply precious. The illustrations are superb and imposing, and at the same time delightful and dreamy. Both my kids cannot turn the pages of this book in a hurry! 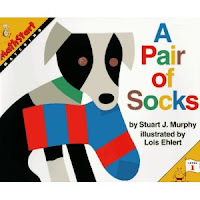 I like Lois Ehlert and I picked up this book before even knowing about the MathStart series. The text is short and easy to follow, and the pictures are in bright bold colors to catch the eye. A lone striped sock wants to find its partner. It looks in the hamper, washer, dryer, the usual places and fails. It finally finds it in the dog basket. Finding the matching pairs of socks in each page makes this a fun learning experience for the little ones while honing the pattern-recognition skills. Plus, there are suggested activities at the back if we want to take it a step further. Not quite a top favorite of mine, but, since I had to read it a zillion time to Og, it managed to grow on me. The book certainly has a lot of potential as a learning tool. I am yet to explore the other MathStart books. The "monster" in the book is the little sister who throws tantrums, bites, pulls hair and can generally be annoying to her older brother. Rather than reacting militantly, in anger, the book suggests positive ways to deal with such situations: "What do you do when a monster pulls hair?/Show it your teeth and pretend that you'll bite?/Forget all your manners and start a big fight? No, no NO! The best thing to do when a monster pulls hair/Is find its soft tummy and tickle it there." The repetition and rhythm, plus the bold bright pictures makes this book a fun read. The book easily appealed to Ana, even if she doesn't remember to practice it with Og when he pulls her hair or throws his truck at her. Oggie, at two, possibly didn't quite get the whole picture, but, he seems to have caught on the fact that there is no "monster" in the book and that the little girl is pretending to be one. But the "No, No, No!" part and the suggested positive action did filter through to him somehow. Sound delicious :) Will fwd to my toddler nephew's parents. Thanks! We also love all Nick Butterworth books for toddlers. Are past toddlerhood long ago but refuse to get those out of our bookshelves. 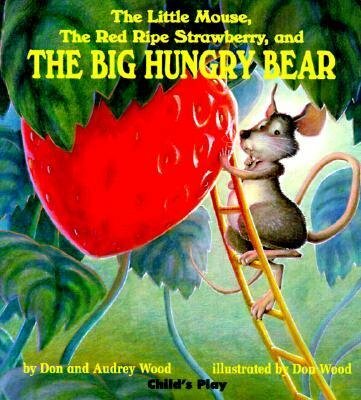 I've read The Little Mouse, The Red Ripe Strawberry, and The Big Hungry Bear to my two hundreds of times. There was a time when I had the book memorized. When my son got older he discovered the Charley's Alphabet series also by the Woods.